The Gowanus Lounge: Starrett City Sale Going South (in a Hurry)? Every now and then, you can feel a deal starting to fall apart as criticism mounts. So it is with the $1.3 biliion sale of Starrett City as public officials pile on. One of thoese leading the charge is Sen. Charles Schumer, yesterday he sent out a letter and press releases that said the deal was made through a "fatally flawed" bidding process that excluded the Department of Housing and Urban Development. Today U.S. Senator Charles E. Schumer demanded Starrett Associates go back to square one on the Starrett City sale. The Senator, who is chair of the Senate Housing sub-committee said today that the bid process was fatally flawed, having excluded the federal government, which has subsidized Starrett City for years so that it could maintain its affordability. Schumer noted that the Department of Housing and Urban Development has the right to approve the deal, and has expressed deep skepticism due to the potential of massive loss of affordable housing stock. In the meantime, the Daily News is reporting that the new landlord may have to raise rents because the seller "did not accurately disclose to bidders how much rent the vast complex generates...The sellers failed to mention a $10 million rent concession to as many as 1,000 tenants at the sprawling development of 46 buildings in south Brooklyn, the source said." 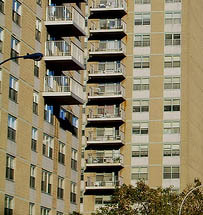 About 90 percent of the tenants of the 5,881 apartments at Starrett City get rent assistants. The buyer's history at 71 other buildings his firm owns includes 8,792 housing violations.